Chennai: Indian scientists are investigating whether a man was killed by a meteorite, which if confirmed would be the first recorded death from falling fragments of space rock in almost 200 years. Jayalalithaa Jayaram, the chief minister of Tamil Nadu, has said a bus driver at a college in her state was killed by the meteorite and awarded Rs.100,000 in compensation to his family. “A meteorite fell within the college premises,” Jayalalithaa said. The man “sustained serious injuries and died while on the way to the hospital”. Jayalalithaa, a former film star, left tight-lipped local officials struggling to explain the mystery blast at the engineering college that left a small crater and broke windows. The bus driver was standing on a patch of grass near the college cafeteria when he was killed, while two gardeners and a student were injured, officials said. A dark blue stone resembling a diamond was found at the scene. Government officials at first suspected the blast was caused by explosives accidentally left after building work. However, investigations found no evidence of explosive material at the site. A team from the Indian Institute of Astrophysics was expected to visit on Tuesday to collect samples. G. Baskar, the principal of the college in Vellore district, was working in his cabin when he heard an explosion. The last reported death from a meteorite strike was in 1825, according to a list kept by International Comet Quarterly, a scientific journal. Simon Goodwin, an astrophysics expert from Britain’s University of Sheffield, said meteorite deaths were rare because the rocks usually burn up when passing through the Earth’s atmosphere or land in the ocean or hit remote areas. “When you look at the fraction of the Earth’s surface that is heavily populated, it’s not very much,” he said. 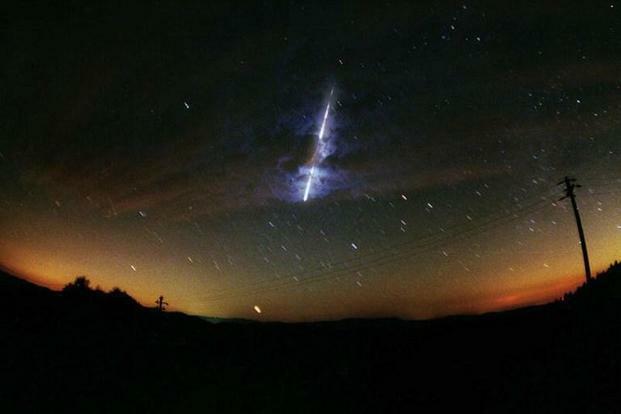 In 2013, a meteorite exploded over central Russia, raining fireballs over a vast area and causing a shock wave that smashed windows, damaged buildings and injured 1,200 people.